We are very excited – and very proud – to announce the launch of Viking Ocean Cruises.From the river to the sea is a natural journey, and the 2015 maiden season the brand new ocean ship, Viking Star, heralds a new era in cruising. Imagine. We’ve taken everything our guests love about our award-winning river cruises and put it all – and more – into an extraordinary ocean cruise experience. Exciting destinations. A small ship that’s full of stunning innovations. Fabulous food. Inspiring itineraries that give you more time ashore so you can really explore. And, of course, fantastic value for money with lots of inclusions such as free wi-fi and drinks on board. With so much to look forward to, staterooms are sure to sell fast. 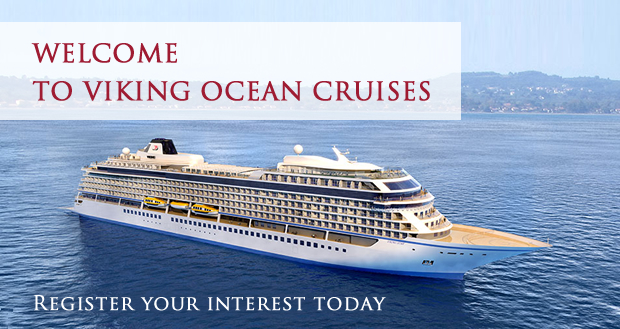 Register your interest today, and make sure you’re the first to know when the Viking Star goes on sale.